Over 500 room nights, cooking classes, tours and funds donated to charities since 2008! Global Activisim +. Organic farming=A Responsible Business. A DISABLED US MILITARY VETERANS PROJECT USING FUNDS TO HELP OTHER VETERANS. Grover is a town in Cleveland County, North Carolina, United States. The population was 698 at the 2000 census. Grover is a small, colorful railroad based town thriving off the NC/SC State Line just off of Interstate 85. Grover was once named Whitaker, NC but was changed to Grover after President Grover Cleveland. Grover is a welcome spot for travelers to typically eat and purchase inexpensive gasoline or vist the numerous casinos in town (called sweepstakes halls). It holds an antique look to it, especially on Gingerbread row (Cleveland Avenue) where many homes are restored or being restored. Grover has been a previous home to the internationally famous and historic - Entertainment Distribution Company (EDC). Pressing billions of music CD's for the most famed artists in the world as well as a recent 300 million USD expansion by Southern Power of a gas fired power plant. The name of the County that Grover is a part of, is historic Cleveland County. The County is actually named after Colonel Benjamin Cleveland (Cleaveland - Thorkil de Cleveland of Cleveland County, York, England in the year 1066) - famed of the Kings Mountain battle - a friend of Colonel Frederick Hambright (with his son John by his side) during the Revolutionary war. In 1887, the Legislature voted to change the name of Grover's County to the more popular used English word version of, "Cleveland." President Grover Cleveland had been in office since 1885 (The First Democrat elected after the Civil War, Grover Cleveland was the only President to leave the White House and return for a second term four years later). This portion of history bears explanation and how it affected local matters. A bachelor, Grover Cleveland was ill at ease at first with all the comforts of the White House. "I must go to dinner," he wrote a friend, "but I wish it was to eat a pickled herring a Swiss cheese and a chop at Louis' instead of the French stuff I shall find." In June 1886, this predicament would be fixed for Grover and Grover. President Cleveland married 21-year-old Frances Folsom; he was the only President ever married in the White House. Naturally, this event and the honeymoon took on historic and unprecedented news attention and mention - in the papers and magazines. The name change of Grover's county took on epic proportions, likewise, shortly after this event. Cleveland Avenue (Route 226) runs right through Grover - parallel to Main Street. Many Hambright's, Hamrick's and Herndon's lived on Cleveland Avenue. Today, the Shiloh Presbyterian Church (built in 1905) remains next to Doctor Hambright's home that he built after the Civil War. Many other prominent names dominate the makeup of Grover, families like Herndon, Hambright Hambrecht, Phifer, Keeter, Rountree, Hamrick and Goforth, to name only a few. Within the history of Grover - it is often confused with President Grover Cleveland versus Benjamin Cleveland and where the names came from. Grover is a railroad dominated town with fantastic train whistles and bells - started when the Atlanta-Charlotte Airline Railway placed a turntable in the town for engines. They operated from the 1880's to the 1920's and Southern Railway continues to elate and surprise kids to this day. Grover is in the process of restoring itself to a more picturesque town of a turn-of-the-century look and feel. It's strong train history - like it's cousin (Kings Mountain) will show strongly in that. The current Mayor is Mr. JD Ledford, the Town Clerk is Ms. Tricia Willis and the town historian is Doctor Cobia Goforth. This section is a detailed work in progress. Further information is welcomed and helpful. We do not claim to be perfect and precisely, rigidly accurate - but we do aim to make a difference in studying and researching our fine town. History & Culture: Before Cleveland County was officially on any map, the area became well-known for several reasons. In October 1780, a pivotal battle that essentially halted the British advance into North Carolina was fought just to our south. The Kings Mountain National Military Park commemorates the Battle of Kings Mountain. In addition to our rich military history, the county is also known for cotton farms and successful textile mills and politics. In 1841, Cleveland County was formed from the existing counties of Rutherford and Lincoln. The county's name was chosen in honor of Revolutionary War hero, Colonel Benjamin Cleaveland. The following year, in 1842, the county seat was established and named Shelby after another Battle of Kings Mountain hero, Colonel Isaac Shelby. From the 1800s to the 1960s, Cleveland County’s primary form of subsistence was agriculture. Wheat, sweet potatoes, and oats were all grown in the area, but cotton was king. Cotton was so plentiful that in the 1940s, Cleveland County produced a larger yield per acre of cotton than any other county in the entire United States. During the height of cotton production, there were 25 textile plants located here. By the 1960s, manufacturing firms began to crop up with over 100 producing their goods in Cleveland County. In that same year, there were more than 125 grade “A” dairies and more than 400 farmers manufacturing milk. By 1980, manufacturing plants were becoming more diversified. Now, the county is still home to several farms and a few specialized textile plants, but the economy is largely made up of manufacturing firms, distribution centers, and small businesses. Shelby: Shelby was formed soon after the county was incorporated on land donated by William Forbes and James Love. Shelby became the center of Cleveland County’s government and the official county seat. The founders of Shelby named the main streets after Revolutionary War heroes Lafayette, Marion, Warren, DeKalb, Sumter, Morgan, and Graham. The picturesque court house, now serving as the Cleveland County Historical Museum, was built in 1907. The former court house still serves as the center of the uptown business district. Kings Mountain: Originally a postal route named White Plains, Kings Mountain is the second largest city in the county. The city was renamed in 1872 when a train depot was erected. Kings Mountain was named by the postmistress in honor of the Revolutionary battle fought a few miles away in South Carolina. 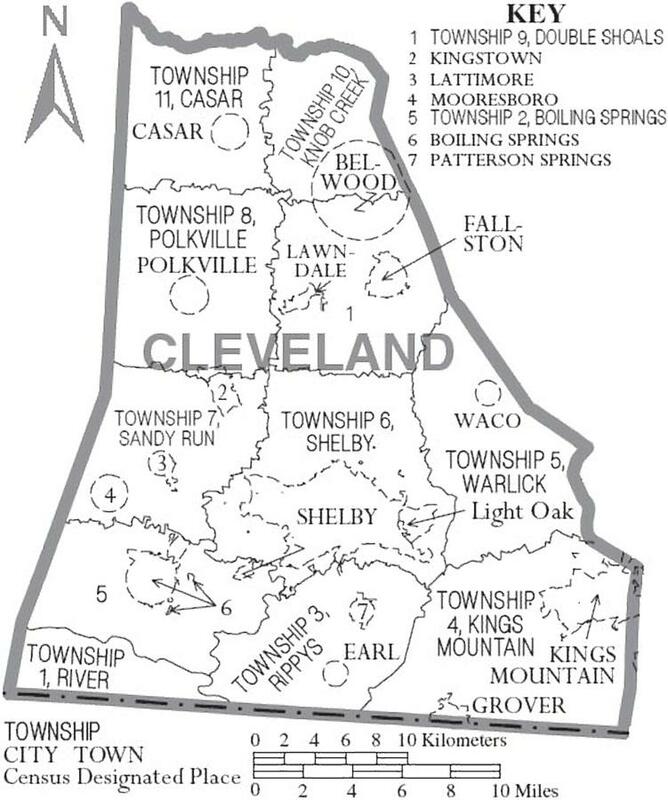 The Municipalities: Along with the county seat of Shelby, and the City of Kings Mountain, Cleveland County also includes the towns of Belwood, Boiling Springs, Casar, Earl, Fallston, Grover, Kingstown, Lattimore, Lawndale, Mooresboro, Patterson Springs, Polkville and Waco. All of these towns have their own rich history and unique personality. Historical Figures: Cleveland County has many well-known historical figures. For several years in the early to mid-1900s, many of North Carolina’s political leaders hailed from Shelby. The group, originally known as the “Shelby Ring” included O. Max Gardner, Clyde R. Hoey, Yates Webb, James L. Webb, and Otis M. Mull. Gardner served as governor from 1929 to 1933 and was the Ambassador to Great Britain. Hoey was North Carolina’s governor from 1937 to 1941 and a United States Senator from 1946 to 1955. Yates Webb became a federal judge after serving 26 years in Congress; his brother, James, was a Superior Court Judge. Mull served eight terms in the North Carolina House of Representatives. The time period is now known as the Shelby Dynasty. Other notable natives include 1924 Pulitzer Prize winner Hatcher Hughes; Earl Scruggs, legendary bluegrass musician; NBA-great David Thompson; author W.J. Cash, novelist Thomas Dixon; and film producer Earl Owensby. Historical Places: According to the authors of the book, Architectural Perspectives of Cleveland County North Carolina, Cleveland County’s history can be read in its architecture. With the success of the county’s agriculture after the Civil War, many Victorian-style farm houses were constructed. In 1907, Webbley, also known as the Governor O. Max Gardner House, was built in what is now Uptown Shelby. The beautiful Classical Revival house was operated as a bed and breakfast for several years and is designated a National Historic Landmark. Other homes on the National Register of Historic Places include the Smith-Suttle House (Twin Chimneys), the Joshua Beam House, the Dr. Victor McBrayer House, and The Banker’s House in Shelby. The John Lattimore House in Polkville and the Irvin-Hamrick Log House near Boiling Springs are also on the National Register. Additional buildings and areas included on the list are the Central Shelby Historic District, the Masonic Temple Building, the Cleveland County Courthouse (now the Cleveland County Historical Museum) and E.B. Hamrick Hall at Gardner-Webb University.